Gels, Hair Waxes, Pomades, Hair Sprays, Hair Straightening Products, Dandruff Treatment, Hair Dyes and Colors, Brushes, Blow Dryers. We recommend the following brands : Matrix, Sebastian, Paul Mitchell, Redken, KMS, Bed Head, ICE, ABBA, Biolage, Nioxin, Amplify, Vavoom and more. Whether it’s protection for hair’s radiant color, preserving those bouncy curls or serious repair for overworked hair, Matrix Essentials has the formulas – each designed to be used synergistically, one with the other, for maximum results. Professional stylists rely on Sebastian’s complete line of styling products to help create the shape, texture, lift, shine, and feel they’re going for. Sebastian products are essential design tools, offering versatility and ease of use. Paul Mitchell products have long enhanced all stages of haircare with their natural extracts and materials. 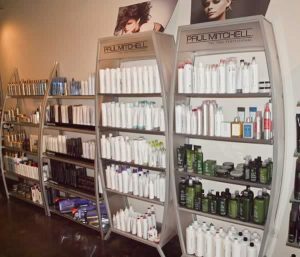 Using latest technology Paul Mitchell enhances the functionality and benefits of the natural elements. Paul Mitchell hair products produce nice shine, moisture and strength. NIOXIN offers hair loss treatment products. Their products cleanse the scalp to prevent thinning hair. Nioxin will strengthen the hair follicle and energize cellular activity. NIOXIN is a drug free natural product.